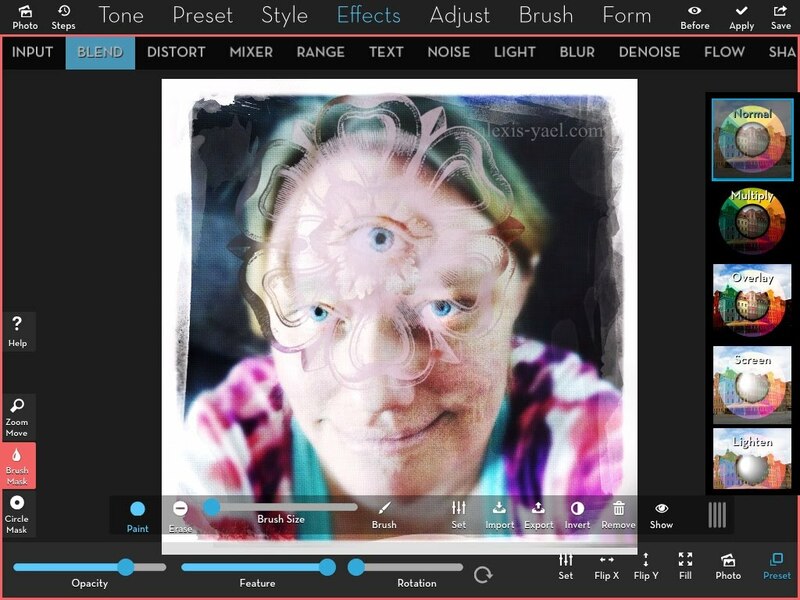 The other day a friend asked me how I do these third eye double exposures. 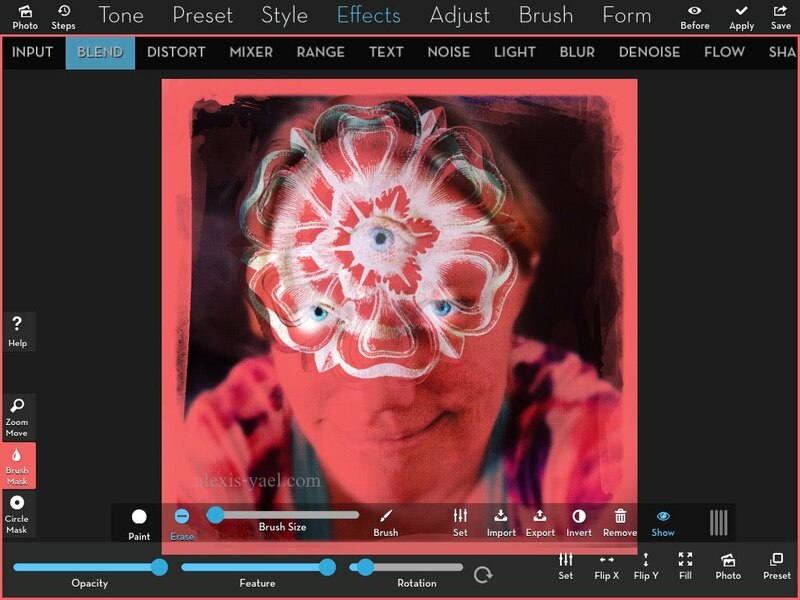 Yesterday, I was inspired to create a fancy one and I screencapped the process using the app iColorama on my iPad mini* so that I could do a tutorial. I opened up my first photo (which was taken with Hipstamatic's Oggl app). This is the base photo, the one that's going to have the most real estate in the final photo. I am going to mask away most of the other photo (except that lacey eye). 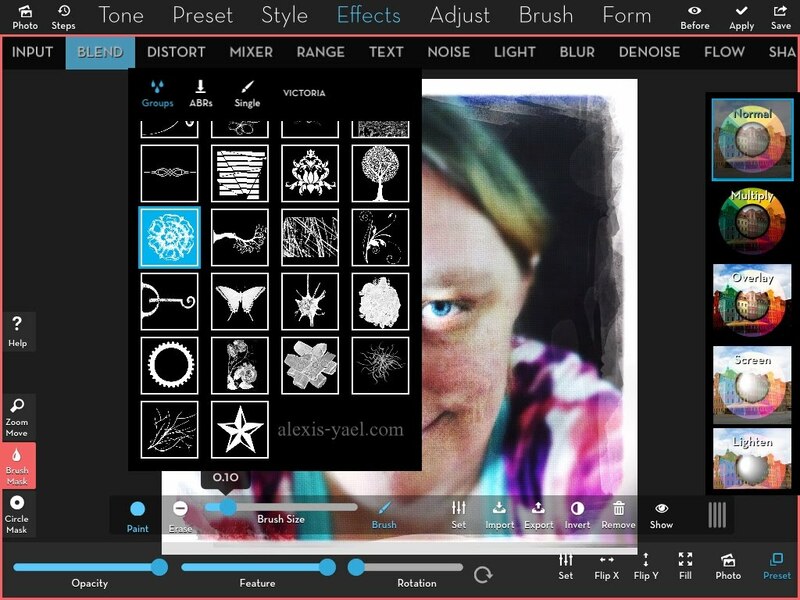 In iColorama, this is called "brush mask" and it's in the menu on the left hand side of the screen. In photoshop, this is generally referred to as "layer masks." 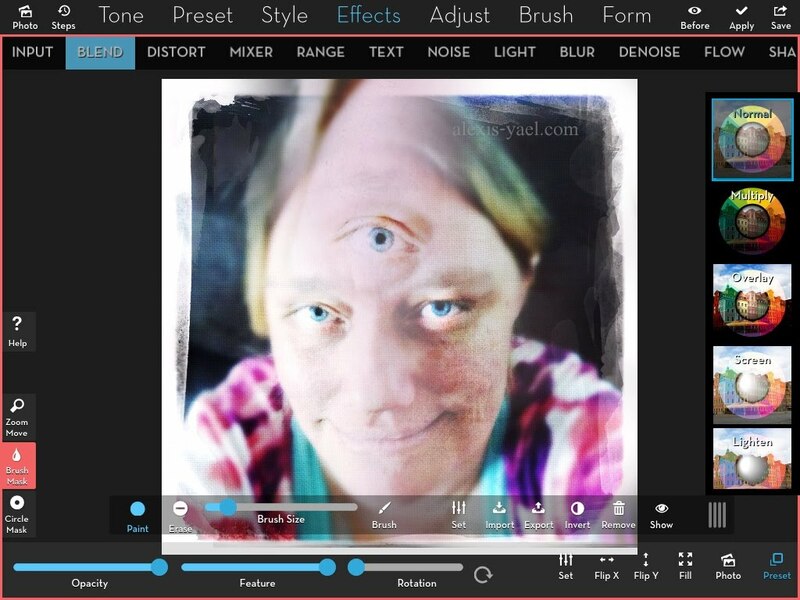 In PicMonkeyPicMonkey, it is called "overlays" and they switch a lot of the terminology around to be more beginner friendly. I'm using iColorama on my iPad. This is how the photo pops up, once it's selected. I generally want the photos to be the same size, so next I click "fill" (also on that bottom menu). Then I use my fingers and move the photo into place, so that the eye is lined up in the center of my forehead (third eye style). The photos are lined up, so it's time to use that brush mask! Paint off everything but the eye. (Yes, it is literally that easy.) If you make a mistake (if your brush size is too big, for example), you can erase, which means the layer can now be seen on top of the first image. The screencap above is from after most of the top photo had been masked off. I left a little at the top to show you where else needs to be masked. I also switched to a smaller brush at this point. To get fancy, I painted out the entire top photo and then used a special brush to erase the eye back into the photo. You can then toggle to "single" to change which of that group's designs you want to use. I used the default one here because I liked it. If you want to see what you've painted during this process, just toggle "show" and this red layer shows you what you've masked off. (This screen cap is a recreation, because I forgot to cap it during the process of making the photo, so the brush doesn't exactly line up). Masking is probably the most important photo manipulation tool and also probably one of the ones it is most difficult for a beginner to wrap their head around. 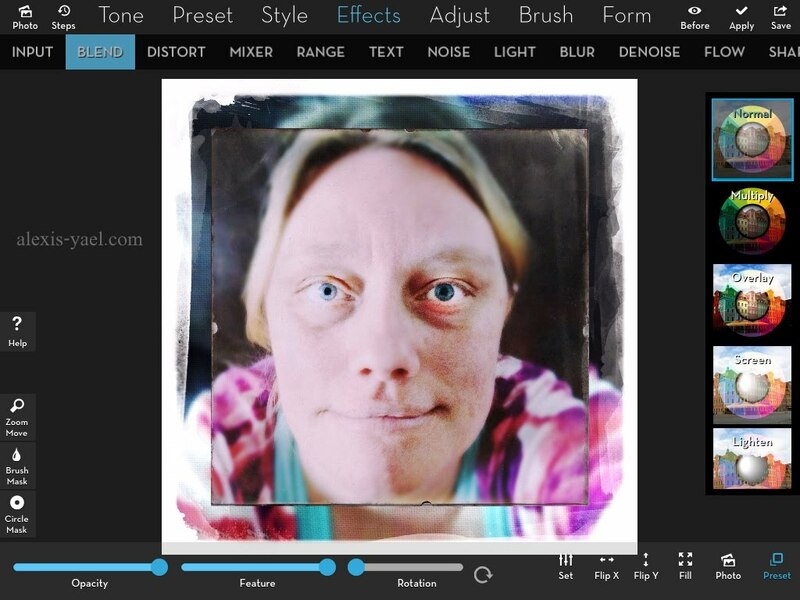 Luckily for beginners, there are many, many basic tutorials in brush masking available. With just the lacey flower brush, the third eye on this photo isn't very clear. I switched back to the first, most basic circular brush, to clear the lace of the eyes. I also switched to a smaller brush size, because I only want to touch up the pupils. I also turned down the opacity (the bottom left slider) of the top layer, so the third eye is slightly paler than the main image. And then I hit "apply" and then "save" at the top right. If you have questions, please feel free to ask me using social media - Facebook or Instagram are best - I turned off comments on this blog as an experiment last year and don't have any plans to reinstate them. * If you don't have an iPad, iColorama is available for iPhone (and iPod touches). 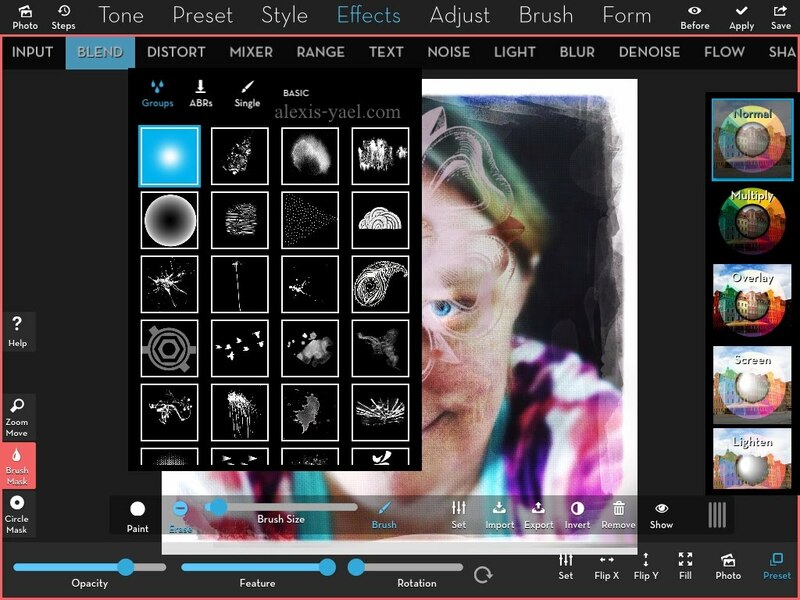 On my Windows 8 phone, I use Photo Editor by Yu-weiz, which does not have such fancy brushes as iColorama, but is simple and free. 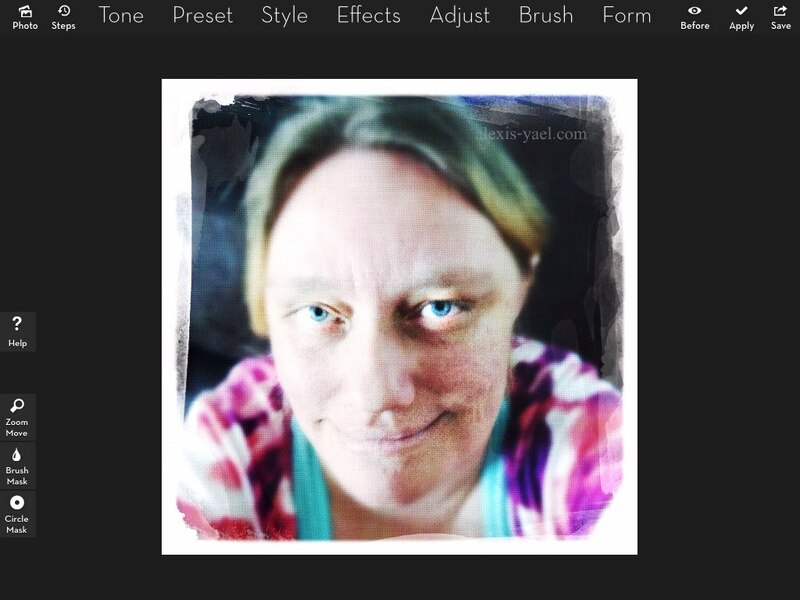 If you'd like a free online editor, I recommend PicMonkey.